We've done many version launches by now, but this was the first time we did an event to toast a launch. There's simply a lot of excitement around it. We had around 120 guests, journalists, friends, colleagues and key figures from the Israeli high tech industry. The venue was amazing. It's called LalaLand it's right on the beach of Tel Aviv. Rather than us telling everybody at the event what eSnips and Social DNA mean for our users, we thought it would be better to invite an eSnipper to tell in their own words, who they are, how they discovered eSnips, what they do on the site, the people they met, and their thoughts and experience with the newly launched Social DNA. 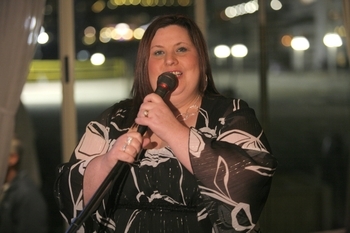 We approached a few of the singers from the Karaoke Community and Genise Gee from Scotland agreed with delight. She was definitely the highlight of the party. Genise simply wowed everybody from the production team who's heard it all before, to the last guest in the event. She sang 2 Abba songs that we requested of her and one of her own favorites. And then out of the crowed came Catalin, an eSnips karaoker that knows Genise from eSnips, who we discovered lives in Tel Aviv. At first he was really shy but eventually got on stage and sang a duet with Genise. We'll upload more photos and a video from the event will be on eSnips soon. Packing again, and the destination is (...again) SF; to speak at the Personal Infosphere Workshop at Supernova (June 21 - 23). The workshop sounds great. Moderator is Jeff Clavier (SoftTech VC) whom I've been wanting to meet for quite a while. Other speakers at the workshop are Dalton Caldwell (imeem), Hans Peter Brondmo (Plum), Tariq Krim (Netvibes), Ben Golub (Plaxo). I'm actually curious to meet and hear Hans from Plum who's company is most related to what we do than the others on the workshop. Here's the description of the workshop: "Taming the torrent of information available to each of us will require tools that are inherently social (because there is wisdom in crowds), converged (because everything isn't on the Web), and multi-faceted (because everyone sees the world differently). A new generation of tools is using these characteristics to deliver value in a surprising range of contexts"
eSnips Social DNA; Discovering likeminded people version 2.0, launching tomorrow. First eSnips DJ Contest Starts tomorrow!